What Is The Best Way of Cleaning the Inside of Your Car Windscreen? The sun low on the horizon. Swirling mist playing tricks with visibility. An unfamiliar road. Oncoming traffic. And a grubby windscreen that only gets worse as you desperately swipe at it with the back of your hand, an old tissue or a stray jumper. We all know that feeling of rising panic that comes with unsuccessfully trying to clean a filthy windscreen while driving. It’s dangerous and the only solution is to stop safely and do a proper job. But what is the best way of cleaning the inside of your car’s windscreen? 1. Clean the outside of the windscreen first so that you can see any grimy spots on the inside. TIP: Always clean your vehicle’s windows in a shady or undercover spot. If the glass is hot from the sun, the cleaning product will evaporate quickly and leave unwanted smudges or spotty residue. 2. Then wipe the glass down with a clean and dry microfibre cloth to get rid of any surface dust or grit. Why microfibre? It’s lint-free and gently abrasive, so it won’t leave any fluff behind and won’t scratch the glass. A microfibre cloth can hold up to eight times its weight in water and it uses an electrostatic charge to lift dirt up and away from the surface. TIP:	Don’t use newspaper or paper towel. The water-based inks used in today’s newspapers will leave black marks on your hands and smudges on the glass, whilst paper towel will give off tiny bits of fluff that are impossible to clean up. 3. Spray another microfibre cloth with rubbing alcohol and then wipe the glass to get rid of any greasy build-up. TIP:	Remember NOT to use your cloths to clean up any drops or dirt on the dashboard because that will only make your windscreen dirtier! Chemicals and oils from the vinyl and other plastics on the dashboard and in your vehicle’s interior can leach onto the windscreen, especially in the hotter months, so you want to avoid transferring those onto the glass. Cigarette smoke can also add another grubby layer to your car’s windscreen. 4. Then take either automotive glass cleaner (ammonia-free) or put a weak solution of vinegar and water or warm water with a drop of household dishwashing liquid into a pump or trigger bottle and spray it onto another clean and dry microfibre cloth. TIP:	Don’t spray directly onto the glass because that just creates more work for you! Drops can fall onto the dashboard or the seats and they’ll need to be cleaned up - plus there’s the issue of wasted spray going into the atmosphere. 5. Finally, dry the glass off with another clean microfibre cloth. TIP:	Always use a straight backwards/forwards and an up/down motion rather than a circular movement to clean the inside of your windscreen. Apart from looking good, a blemish-free windscreen is about safety. When your visibility is impaired, driving is dangerous, so it’s crucial to take immediate action. Cleanliness is one thing, but you also need to take immediate action when you get a chip or a crack in your windscreen because these can quickly escalate into major problems. 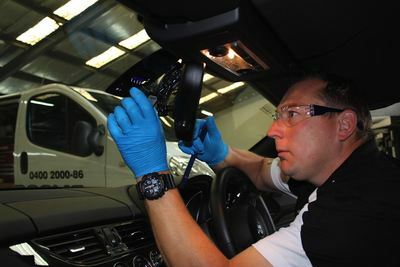 Unless they’re directly in your line of vision when a total windscreen replacement may be necessary, a small chip or crack is generally simple and cost-effective to fix. Using newspaper and water or a bit of vinegar in the water.